Chances are good that over the next couple of weeks, you'll be attending a few holiday parties. You'll be needing hostess gifts. Flowers, wine, and fudge are all fine, but truffles are better. Truffles are elegant and stylish. Better for you, truffles are easy to make, really easy. 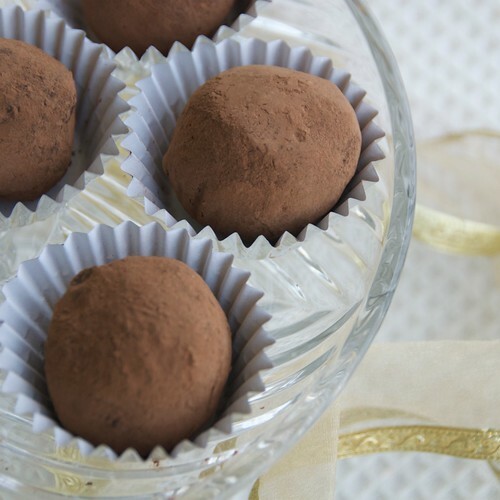 Here's a recipe for Easy Ginger Chocolate Truffles that I love and know you will too. Rich chocolate is enhanced with spicy, fragrant candied ginger for a uniquely intense flavor. Placed inside of decorative foil cups, these easy ginger chocolate truffles make a festive holiday gift. These truffles are also going into the big Eat Christmas Cookies cookie jar. Want to share your cookies with us? Just send them over by December 20th. Find out how here. And check out the amazing stash of Christmas cookies we've gotten so far. I also just discovered that Nic of the delicious Cherrapeno is hosting this month's SHF, the Holiday Edition. So I'm sending some truffles her way. 1. Put chocolate in a heat-proof bowl. 2. In a small saucepan over medium-high heat, bring heavy cream just to a boil. Pour over the chocolate, and stir with a small spatula until smooth. Stir in the ginger. Cover with plastic wrap and chill in the refrigerator for 1-1 1/2 hours. Check it. The chocolate should be thick yet still pliable. 3. Line a large baking sheet with parchment paper. Using a teaspoon or a melon-baller, scoop balls of chocolate and drop them on the prepared sheet. (Don't worry about shaping them. That comes later.) Place the pan of truffles in the refrigerator for 15 minutes. 4. Place cocoa in a small, deep bowl. Dust both palms with cocoa. Roll each truffle into a ball. Drop in the cocoa until coated. Shake off excess cocoa. Place in decorative paper or foil cups, if using. Store truffles in an air-tight container in the refrigerator for up to a week. You may need to reshape or redust with cocoa before serving. Serve at room temperature. Talk about a heavenly combination! I think I've got all of this in the pantry! The word "easy" always gets my attention this time of year! A wonderful recipe! Mmmhhh, chocolate and ginger! Love the ginger and chocolate combination and the truffles look so so perfect. Ooh, love these! Hint to anyone coming to my house soon - make these and bring them to me! These look incredible! I do love your blog. Great job! teachercooks-I appreciate that so much. Thanks. Susan, my wife would looooove these. Ok, I would too! These look wonderful, Susan and they will be going to our next holiday party this weekend. Thanks for such a great idea! I really need to make these Susan. They are right in lkine with the "easy on the cook" baking recipes I like to make during the holidays. Perfect for Christmas - I love the sound of these! Your blog looks yummy. Thanks for sharing the recipe of Easy Chocolate Ginger Truffles. Enjoyed it very much. The combination of chocolate and ginger sounds amazing. I'll add it to my list of treats to try. Thanks! Ginger and chocolate is one of the best combinations you can get, and the truffles are the perfect gift to give over the holidays. Thanks so much for your SHF submission! Truffles are an easy treat with a big punch in the impressive category. Win-win! I love the combination of ginger and chocolate. The ginger adds a nice zing to the richness of the chocolate, and almost makes it easy to eat even...more! Can I just tell you how happy this recipe makes me? You rock, lady. Chocolate and ginger... love it! Ola Susan-u made my day-the joys of spring(love d nt v colc winters though) over whelm me now...thanx a ton and yeah am baking today too!! !and found this blog last night and i was like this one is cool-am out looking for cookie recipes here w a crunch-they delight me and mommy has got me another goody bag for my baking that am jus so so excited with!!!! Hmm, I have all of the ingredients in my pantry. Might have to try these tonight. Candied ginger is good on it's own. Combining it with chocolate just makes it so much more irrisistible!